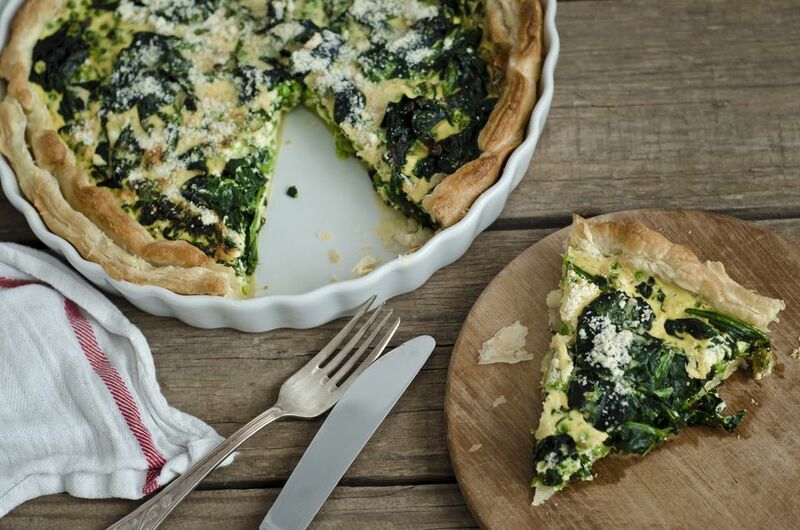 Spinach and Onion Quiche works as a classic combination. The two main ingredients work so well together and especially good in a quiche. This savory quiche is also an incredible timesaver in the kitchen because it can also be made without a pastry crust. Of course, if you have time for a crust, make a batch of Pate Brisee a few hours ar even the day before preparing the quiche, this gives the pastry plenty if time to rest, very important if you want the pastry to not shrink in the oven when cooking. Without the crust, simply whisk all the ingredients together and bake as shown below. Though, it must be said, without a crust means this is not a quiche. In a small bowl, mix the flour and salt. Add the butter then either using a pastry cutter, large-tined fork or a food processor on pulse setting, cut the chilled butter into the flour until it resembles coarse sand. Do not worry if a few pea-sized pieces of butter remain as this will add a buttery tinge to the finished pastry. Sprinkle the water a tablespoon at a time over the mixture and mix lightly until the pastry starts to clump together. Once this happens, scoop the pastry into a ball and wrap in plastic wrap and chill in the refrigerator for anything from 30 minutes to a couple of hours. You can also make the pastry the day before. Roll out the pastry to fit an 8-inch by 8-inch pan or pie dish. Lightly grease the tin the line with the pastry. Whisk all the filling ingredients together and pour into the pan. Place the pie tin lined with pastry onto the middle shelf of the oven, then carefully pour in the filling making sure it does not overflow. Cook in preheated oven for 60-70 minutes, until it tests done in the center, it should be firm but not solid. The baked quiche can be eaten warm but not hot and straight from the oven, or it will fall apart. Let it stand for at least 10 minutes. The quiche can also be eaten cold, but never directly from the fridge, or it will be too hard and the flavours dead. Always allow it to come to room temperature before serving.